A huge storm, cyclone Phailin (pronounced: phie-lin), is approaching the states of Odisha and Andhra Pradesh on the eastern coast of India and will probably also cause heavy rain in neighboring states. 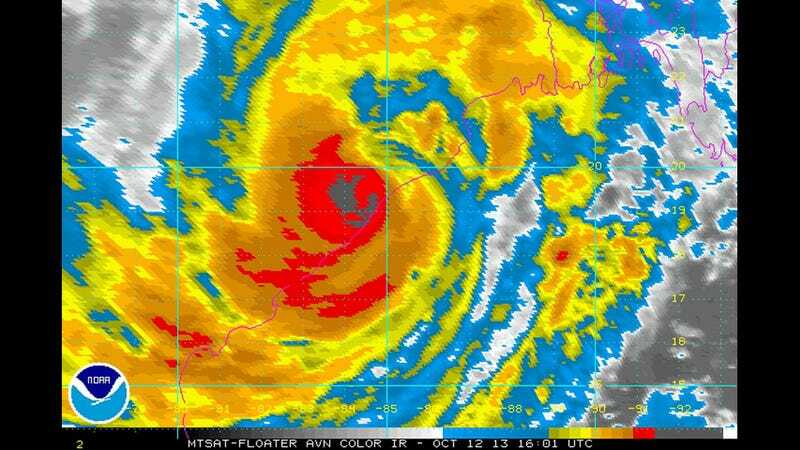 Indian authorities evacuated half a million people over the past few days as predictions about the storm grew more dire. Mother Jones reports that the India Meteorological Department described Phailin as "very severe," and clearly officials have been taking action to prepare for emergency scenarios. But U.S. meteorologists have been even more extreme in their predictions. Brian McNoldy, a hurricane researcher at the University of Miami told The Associated Press that, “If it’s not a record, it’s really, really close. You really don’t get storms stronger than this anywhere in the world ever. This is the top of the barrel." Anywhere ever. Oh P.S., cyclones, typhoons and hurricanes are all the same thing they just have different names based on where they're happening.